As I gather material for this month’s newsletter, I count 13 events, seven opportunities, five news items, and two resources, and I reflect on the wealth of opportunities we have for getting involved. Yes, it is great to read about what goes on in the interfaith and interspiritual scene in Canada, the U.S. and worldwide. It is even more satisfying to attend some of the events and network with others there. To that end, please notify us of upcoming events and send us brief reports after attending them, as well as other local news to canada@theinterfaithobserver.org. You can write essays which we would consider for publication. But the most enriching way to get involved is actively volunteering. Every interfaith council or organization in your area needs volunteers. Whether being part of a working committee or just assisting with programs, your involvement is appreciated, you learn from it, and gain the satisfaction of being an active member of a major growing movement toward a better and kinder world of unity in diversity. Respond to Shahid Akhtar about his proposed SynaMosque worship space. 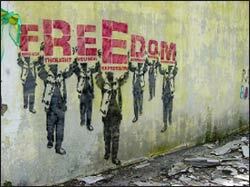 Volunteer for editorial and reporting help with TIO in Canada. Propose a paper to the International Conference on Religions and Social Innovation by May 3. Submit a short or long film or video to the COMMFEST Community Film Festival. Recommend that young people apply for the Gathering Linking the Wisdom of the First Nation Elders with the Energy of the Youth in Manitoba this summer. I have been a volunteer for all my adult life, and the last 20 years for the interfaith movement. And I have always received from it far more than I gave! When it comes to promoting religious freedom, the government could do with a little more fairness right here at home. Less than a month after the Conservative government officially established the Office for Religious Freedom, a multi-faith flock of Canadians is taking the government to court for violating the very freedoms the government pledges the new office will promote abroad. He was head of the Canadian Human Rights Commission and also a member of the UN committee monitoring the International Convention of Civil and Political Rights. In retirement, Max Yalden winters in France, where I reached him. What does he think of the recent Supreme Court ruling that free speech can be, must be, restricted, not overly so but somewhat, in order to curb hate speech? Chaplaincy originally is a term coined by Christian pastors serving the wounded in battle centuries ago and nowadays it refers to religious and spiritual caregiver service to any person, whether they are patients in a hospital, inmates incarcerated in a prison, soldiers in an army, employees in a workplace or students attending university. Chaplaincy has grown to become an accredited profession with necessary credentials required to serve those vulnerable within the laws of the nation as well as the respective authentic tradition the chaplain represents. A chaplain may facilitate persons of other religious persuasions arranging to have a representative attend to the needs of the person in need through a mutually respectful and knowledge-based process. What are some of the tasks the Muslim Chaplains Perform? 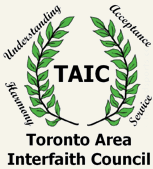 The Toronto Area Interfaith Council’s (TAIC) annual members’ meeting confirmed a focus on the social justice issues of poverty and violence, and will seek opportunities to cooperate with appropriate organizations. In addition to the usual organizational agenda, the meeting was enlivened with a guest speaker, reflections from two faith representatives, and a final go-around which gave voice to everyone there. TAIC is the sponsor of the August 11-14 North American Interfaith Network (NAIN) Conference this year. The Executive is composed of: Zul Kassamali, President, Muslim, Fr. Damian MacPherson, Past President, Roman Catholic, Liz Chappel, Vice President, Baha’i, Bob White, Secretary, Roman Catholic, Sam Vesuna, Treasurer, Zoroastrian, John Joseph Mastandrea, Social Convenor, United Church, and Earl Smith, Liaison to NAIN Connect, Scientology. It is the last that we need to address. Dialogue toward action. Among the major problems in our affluent society are the large numbers of working poor, the low social assistance, which is cut back if one works at all, and the lack of sufficient housing for those with low income. 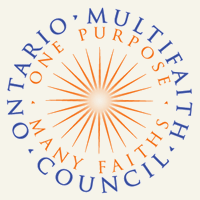 Although the Ontario Multifaith Council’s government funding has ended, OMC will coninue to operate in a reduced capacity at a new location: 3570 Victoria Park Avenue, Suite # 207, North York, Ontario. Dr. Mohamed Taher, 1-888-837-0923, has been rehired to continue with his work with the Multifaith Information Services. Click here for the extensive Multifaith Library. Professor Tariq RamadanWhether we are Christian or Buddhist, Jewish or Muslim, secularist or believer, Tariq Ramadan suggests that all traditions of thought spring from the same place, and guides us to see past what divides us and discover the beauty of what we have in common. In his lecture Professor Ramadan outlines the approach to pluralism presented in his book The Quest for Meaning: Developing a Philosophy of Pluralism, a searching analysis of the challenges involved in creating pluralist societies and an insightful assessment of areas of common ground, which have the potential to bring out the best in one another and become a force for good within the world. Poster From Surrey Interfaith Newsletter, B.C.